Inventory management mistakes can be fairly simple to fix, but the solutions will take some effort. Some companies are unwilling to put in the necessary work, but those that do quickly realize that it’s worth it, paying dividends in the form of larger profit margins. Some of these solutions also fall under the “spend money to make money” category, which is generally unappealing to many companies. The following four inventory mistakes are fairly common, but with a bit of time, effort, and money, you can implement solutions that will rectify them and improve your business. There are a few problems with relying on untrained employees: they might be inefficient and, depending on the industry, unsafe. If they feel they are not being trained, they may also look for another job. Employees that don’t know what to do, or how to do it, are probably going to be slow to get the job done. For inventory management, that might mean they do not know how to properly use software. Not only is this inefficient, it could lead to inaccuracies, costing the company more time and money. The need to search for answers means untrained employees are wasting valuable time, and they might even try asking other workers to pick up their slack, reducing overall workforce power. For example, an employee might not know how to safely stack certain items, or that there are stacking tolerances. Too many stacked boxes could crush inventory at the bottom of the pile, which could then potentially fall over and hurt someone or damage other inventory. Or imagine an untrained employee hopping on a forklift, thinking they know how to work it after seeing coworkers do it. A pallet of product could wind up broken on the ground, or the forklift could tip over. In short, they can reduce the bottom line, either due to inefficiency or by causing workplace accidents. Investing in a 10-percent increase in employee education can yield as much as 8.6 percent increased productivity, as training shows employees how to work smarter and more efficiently, according to Business Know-How. It doesn’t take much, either. An IBM study found that 40 hours of training per member meant employees met significant project objectives three times as often as teams that received 30 hours or less. The same study also found that having a skilled workforce meant a 16-percent increase in customer satisfaction, a 10-percent increase in productivity, $70,000 in annual savings, 35-percent reduction in time searching for sales content, and 22-percent faster rollout of products and processes. In inventory management, that means training employees in all aspects. They should know how to organize items and inventory, and how to properly utilize inventory tracking software. Recurring training sessions on various processes and procedures are ideal, especially when changes occur often. Having an open-door policy for questions can help, as well. Using Excel for tracking inventory used to make sense. Continuing to rely on Excel, however, isn’t just suboptimal, it can actually slow your warehouse systems down and end up costing you more in the long run. Excel is not automated, which means all updates must be made manually. This can lead to human errors, which, in turn, leads to a slew of problems like over- or underselling, costing the company time and money. Product updates in a manual system are also much slower. It’s a fairly simple fix: switch to an automation-friendly tracking system. This will greatly reduce or even eliminate your margin of error, freeing up your employees to do other tasks. SKUs will be entered accurately, the correct number of products will reach customers, and products will update near-instantly. As a bonus, automated systems are much easier to scale. It won’t take an employee hours to input increasing amounts of data as your business grows. Instead, the data is entered automatically, and the employee can focus on clients. If your warehouse is improperly organized, it’s likely costing you time, and time equals money. A disorganized warehouse means your employees can’t easily find stock. The best-selling SKUs might be higher up, making them harder to reach and slowing workers down. Is there a place to put damaged goods? Consider the ABC method, where A products, or the 20 percent that make up the 80 percent of sales, are always in stock. The B products, which are still important to you as a business, are usually in stock. The C products are only those that consistently sell at a low level, or are requested specifically by customers. 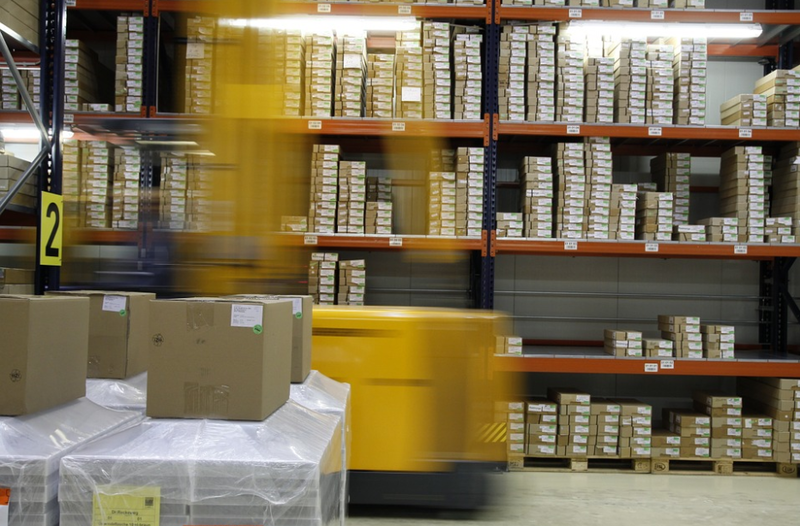 A disorganized, unoptimized warehouse means decreased productivity and efficiency. It will also impede a business’s ability to grow. If there’s inadequate speed and efficiency to warehouse operations, the company will not be capable of delivering more, bigger orders in a timely fashion. Small business owners should do their best to arrange their warehouse in a way that complements workflow. Fast-selling products should be located between waist and shoulder height, allowing for quick retrieval, and should be near the loading or shipping area. While Amazon might have a chaotic warehouse with a nonsensical placement system, kept track entirely by an automated database and often retrieved by robots, this will probably not work for you. Instead, clearly labeled storage areas or containers, such as for a type of product or a damaged product area, can ease the burden of warehouse workers trying to find a specific product. Constant upkeep, rather than waiting until the end of the day, is the key to keeping things moving swiftly. Don’t wait for a lull; take care of things as they need to be done, and keep the workflow smooth. Perform audits often, and consider using cycle counts. As the company grows, make sure the warehouse grows with it. Keep evaluating organization, otherwise workers will spend too much time navigating the forklift to the right place. Once again, time is money. Adopting inventory tracking software that is incompatible with other programs used to run a business can be another major mistake that leads to wasted time and money. If programs aren’t talking to one another properly, then data must be manually input from one program to the next, which can lead to further inaccuracies and issues. Manual data entry takes time, which could be better served performing other duties. Look for a warehouse management software solution that integrates with other frequently used programs. For example, if you use QuickBooks Online, you’ll want a program that will integrate with your spreadsheets, allowing you to manage inventory and sales at the same time. The same goes for integration with other software and apps like Shopify and Shippo. The more your software integrates with each other, the less work you will have to do, and the less data input needs to be done. If it’s an automated process, you only need workers to double-check that the information is right, rather than manually entering it all in. Inventory mistakes are often fairly easy to fix, either with training, updating software, or optimizing inventory organization. The problem is that it often takes time, money, or both, and these can be in short supply for small businesses. However, the dividends that fixing these mistakes pay will be worth the hassle in the long run.